Old Spitalfields Market dates back to 1638 when King Charles issued a license for "flesh, fowl, and roots" to be sold in what was then known as Spittle Fields. It's now a seriously cool place to shop and eat in east London. The market is surrounded by independent boutiques selling everything from cool housewares and artwork to vintage clothes and antiques, and the newly launched Kitchens in the center of the market offers a great street food experience in London. The market is busiest on Sundays, but it's open seven days a week. It's a five-minute stroll from Liverpool Street Station. Here's what's going on at the market each day of the week. Thursday: An antiques market with collectible vintage and retro pieces. Friday: The daily market, and on first and third Fridays each month, there's a vinyl records fair. Saturday to Tuesday: The daily market. The market's busiest day, Sunday, features up to 100 stalls. Bar 3 at Blixen is a cozy basement cocktail bar. Old Spitalfields Market Bar specializes in craft beer, biodynamic wines, and small-batch spirits. It's a covered market but it's not completely enclosed. The sides are open to the elements so it's best to wrap up warm in the winter months. While you're there check out Spitalfield's Charnel House, a vault used to store human bones in the 14th century. On the second Wednesday of each month, the market hosts an evening of swing dancing and live music with free classes for any budding dancers. Visit the site for more information. Brick Lane Market is a traditional Sunday morning flea-market with a wide array of goods on sale including vintage clothes, furniture, bric-a-brac, music, and much more. 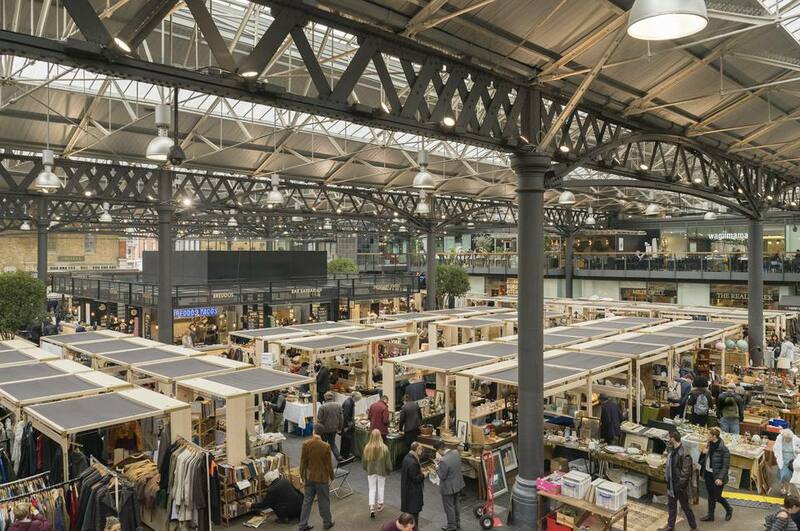 Sunday UpMarket is in the Old Truman Brewery on Brick Lane and sells fashion, accessories, crafts, interiors, and music. Opened in 2004, it has an excellent food area and is a hip place to hang out. Petticoat Lane was established over 400 years ago by the French Huguenots who sold petticoats and lace here. The prudish Victorians changed the name of the Lane and market to avoid referring to woman's underclothes! Every Sunday between 8 a.m. and 2 p.m., you'll find over 50 market stalls and 30 shops selling flowers, and gardening supplies lining this narrow cobblestone street. It's a truly colorful experience.